Constructed of Speedo Endurance Lite fabric, it offers lightweight durability that resists sagging, bagging, fading and snagging. Good for the planet and your own pool performance, this vibrant swimsuit allows you to train in style. PowerFLEX Eco construction results in a shape-retaining fabric that pairs with compression technology for a flattering fit. A built-in Hydro bra and a wide-strap design provide athletic support and increased mobility, so you can move freely. Blaze through meets in a swimsuit engineered to perform. PowerFLEX Eco fabric delivers optimal compression and chlorine resistance while maintaining a body-hugging fit that won't sag or bag. A Drill Back design promotes seamless mobility for faster time. Updated this season with bold new prints, this high-performance suit is designed to let you swim out loud. Constructed with Speedo's hard-working Endurance Lite® fabric, it offers all the performance of their Endurance+ fabric in a 10% lighter weight. Front is fully lined, back features low, open keyhole cut. She'll love working on her flutter kicks in this comfortable, sporty swimsuit. The contemporary design includes panels of heathered fabric and kid-friendly details like a racerback silhouette and silicone grippers at the leg openings to ensure this durable suit stays in place no matter what she does in the water. She'll stand out from the crowd in this vibrant mixed-print swimsuit. It's constructed from a durable, stretchy fabric that can withstand the harmful effects of chlorine and countless hours of cannonballs. Stay-put silicone grippers are placed at the leg openings so she can play in her suit comfortably minus wedgie worries. Look no further than this colorblock parka to keep you warm on cold practice days or in between swim events. Cozy fleece lining and a water-resistant shell make this lightweight, packable style the only outerwear you need. Arena's Spider Booster Back one-piece is printed with a maxi molecule print in an ombre colour scheme. Cut for training and frequent swimming, this women’s swimsuit will be sure to get you noticed. Perform pool workouts with style and confidence wearing this colorful swim top. It's engineered from Endurance Lite, a lighter weight version of Endurance+ fabric but with the same shape-retention and chlorine-resistant qualities for a lasting look. Designed from Speedo's innovative Endurance+ fabric that stands up to bagging, sagging, and the harsh effects of chlorine. The Speedo Turnz Printed Tie Back Swimsuit features endurance Lite has all the performance properties of our Endurance+ fabric in a 10% lighter weight that won't weigh you down in the water. This fun camo-print training suit is ready for duty. Constructed of Speedo Endurance Lite fabric, it offers lightweight durability that resists sagging, bagging, fading and snagging. Built-in Hydro Bra offers Speedo's highest level of support; muscle back design provides optimum range of motion. Get funky with your pool colors in the Speedo Flipturns Women's Propel Back One Piece Swimsuit. Perfect for training swimmers who want to stand out, this one piece features a colorful print design and a sporty V-back for a modern, sleek look in the water. Constructed from the popular, ultra durable Endurance + fabric—a Speedo exclusive; the Flyback with logo Training suit is chlorine-resistant up to 20 times longer than conventional suits. Flaunt your swimsuit style in the pool or on deck. This racing suit is constructed from printed ProLT fabric for lasting stretch and shape recovery, and it features a back design that encourages greater range of motion. The Speedo Endurance+ Women's Caged Out Flyback Training Swimsuit is constructed with Speedo's innovative Endurance+ fabric. this earth-conscious style features a shirred finish for a slimming effect. Swimmers at every level can benefit from Speedo’s exclusive Endurance+ fabric. It’s designed to last 20 times longer than conventional swimwear fabric. technology at the waist create a slimming effect. contoured panels add figure-enhancing flair. A stylish performance swimsuit made to last. ProLT Polyester construction gives this camo-print style lasting stretch and recovery, while a flyback design creates a supportive option to take you through a full race season. The Speedo Women's Sprinter Switch Flyback One Piece Swimsuit is designed from Speedo's innovative Endurance+ fabric that stands up to bagging, sagging, and the harsh effects of chlorine. Designed for the serious swimmer who wants to turn heads while training, a range of bright, colorful prints brighten up every training session. As well as looking fabulous, you will love the flexibility and freedom of movement of the suit. Now you can finally remove the funky smell out of your clothes and sporting gear. Sport Suds Laundry Detergent is specially formulated to dislodge odour-causing bacteria, oils and dirt from your fabrics and wash them away completely. Your clothes become free of residue and are not weighed down with gunk. They smell fresher, last longer and perform better. Unleash the full power of your performance gear and experience the Sport Suds difference. Featuring Speedo's Hydro Bra oval-shaped, removable cups for better coverage and fit and extra-soft plush elastic for a more comfortable, athletic fit. The Zoot Buoyancy short promotes optimal body positionto take your swim training to the next level. By naturallyelevating your body/legs and lifting your hips up, the shortsplace you in the fastest position possible. Promotingthis optimal body position in training creates muscle memory that allows for a more efficient stroke on raceday. Designed with the same high-end Yamamoto materials as all of Zoot Wetsuits. Classic Cross Back design featuring PowerPlus fabric. Show your national pride with this Canadian swimsuit by Speedo. The thin straps provide excellent support and freedom of motion. Engineered from Speedos exclusive, longest lasting and best-selling Endurance+ fabric ideal for fitness and training. Provides excellent support and freedom of motion. The Speedo Powerplus Solid Kneeskin swimsuit is designed to be lighter and reduce drag with the use of compression technology. The suit features a high back and is made from 79 percent nylon and 21 percent Xtra Life Lycra. Orca's Neoprene 3/4 Short is a buoyant swim short to wear on it's own, or to add extra buoyancy under your wetsuit. With an 8mm Yamamoto 39cell SCS coated neoprene front panel, and a 6mm back panel and a 56cm inseam, this neoprene short provides you with the buoyancy you need to be in the best swimming position. Super flexible 3mm side panels provide freedom of movement and promote correct body rotational form. Engineered from Speedo's exclusive, longest lasting and best-selling Endurance+ fabric that is chlorine resistant and designed to last 20 times longer than conventional swimwear fabrics. Features Speedo's Hydro Bra, core compression and a moderate leg height. Engineered from Speedo's exclusive, longest lasting and best-selling Endurance+ fabric, the popular Flyback style is your ideal training & racing suit. Rock your training look with bold, funky prints all about attitude Speedo Flipturns. Engineered from Speedo’s exclusive, most durable fabric, this swimsuit lasts much longer than conventional swimsuits. The Free Back design gives you good range of motion with a supportive wide center back strap. 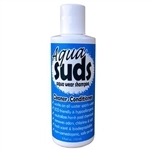 Aqua Suds is an Eco friendly solution for all of your aqua wear. Its fresh scent and unique blend of natural ingredients neutralize harsh pool chemicals while removing chlorine, salt, odors and organic residue. 118ml. Featuring easy to use straps and xtra life lycra, the Snap Suit is the perfect first swimsuit. Built for the fitness swimmer, this streamlined training suit increases muscle support for added power and quick recovery. Enjoy your swim sets with our Performance Swim Fastlane Suit. Stylish and functional, you will appreciate the support and flexibility. A few of the great features include chlorine-resistance, UPF 50+ sun protection, and center front and back modesty lining. If you're looking for a buoyant swim short to wear on its own, or to add extra buoyancy under your wetsuit whilst promoting correct body rotational form. Special Offer: Optional $1 Orca Silicone Swim Cap. Engineered from Lycra Xtra Life durable fiber, this suit is ideal for fitness and training. The Super Pro Back features wide straps for superior support and comfort. Featuring a sporty, contrasted side splicing pattern, this suit is ideal for fitness and training. Built with the same top of the line materials as the award winning Helix, the core short is designed to simulate the lift of a wetsuit resulting in a seamless adjustment to swimming on race day. The Speedo Unisex Team Parka features a water resistant outer surface, is fleece lined for warmth nad has fleece lined pockets, an internal zipper pocket, with a 2-way front zip. Thee Zone3 Buoyancy Shorts are designed to give an alternative to a pull buoy and give a more natural feeling of buoyancy in the pool. Removes chlorine, minerals & perspiration salts from swim & active wear. Stylish design with signature back provides secure fit with flattering silhouette.